This entry was posted in 21st Century Literacies and Skills, Mobile devices, Multiliteracies, Multimedia, Uncategorized and tagged 21st century learning, 21st century skills, apps, contemporary pedagogy, iPads, mobile devices, mobile learning, mobile technology, teaching and learning by ResourceLink Brisbane Catholic Education. Bookmark the permalink. This is wonderful! SO HELPFUL! Would you be able to share what the “workflow wall” looked like? Hi Ann – I’m so glad you liked the post! I’ll try to get a photo of the wall and post it. That would be absolutely awesome! 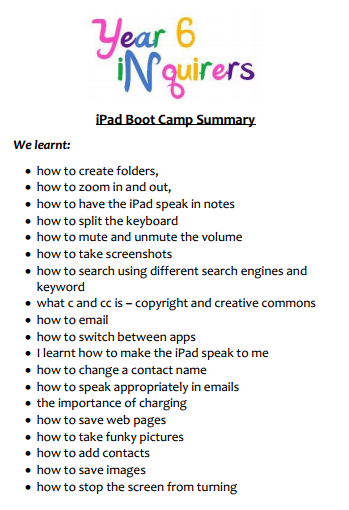 🙂 I’m just starting out with integrating iPads into my classroom, so I need all the help/advice I can get! Thanks for sharing your journey. I especially like the lists of apps; very organized and easy to refer. 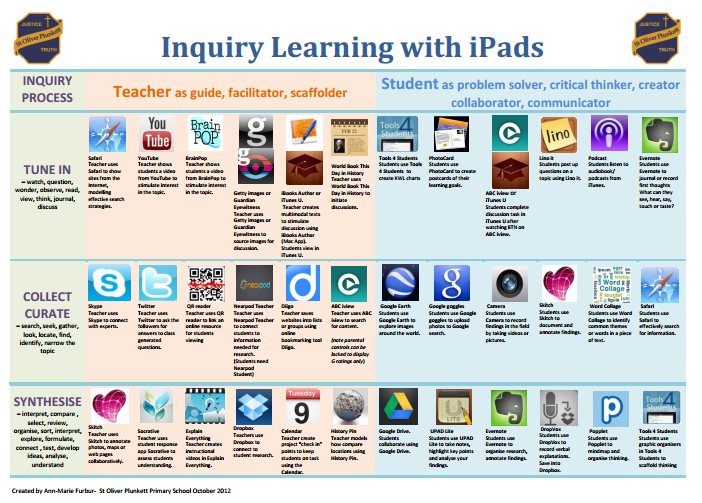 Is it possible to have the inquiry poster in PDF format? I would love to be able to read all the descriptions (bad eye sight:). Thanks! Thanks- I’ll try to get a copy in PDF format. Glad you enjoyed the article! Were you ever able to make the inquiry poster a PDF? I just found it today and love that it includes specific ideas but I’m having a hard time reading it. Just a heads up… Safari and Chrome are not search engines. They are internet browsers. Thanks for this reminder, April, it is always good to get the terminology correct! Can you let me know where you noticed this misuse so I can correct it? I couldn’t find it on this particular post. Cheers. Safari and Chrome mentioned as search engines top left in your core student apps, above. Thanks for the heads up! I don’t actually have the original file to edit this as it belongs to the Year 5 teacher who generously shared it, but you are completely correct, they are browsers, not search engine. this web page and at the moment this time I am browsing this web site and reading very informative posts here.